After 3 teams in the AFC North won their first game last week, there is no doubt that they are one of the strongest divisions this year. Sunday will feature a tremendous game between the Cincinnati Bengals and the Pittsburg Steelers, fighting to get an early upper hand this season. Although it is still very early in the season, this week could be a determining point into who wins the AFC North. The last time the Bengals and Steelers played each other was the wildcard game last season where the Steelers had a last minute win, making this an absolute must watch game this weekend. …are a team known for their ability to score big, point in case was their absolute dominance last week over the raining NFC champions, the Washington Redskins. Anyone who selected Pittsburg as their pre-season pick for the Super Bowl based their decision precisely on the fact the Steelers offence is so strong, they were ranked 3rd in overall offense last season, and quarterback Ben Roethlisberger is completely healthy at the moment, something that was not always the case last year. Antonio Brown, the Steelers wide receiver made his presence known at last week’s game by catching 8 passes for a total of 126 yards and two touchdowns. And DeAngelo Williams also had a superb start totaling 143 rushing yards on 26 carries. But Pittsburg’s offence may not have it so easy this week when they face last year’s number 2 scoring defense in the league. …are once again on the road, after defeating the New York Jets last week 23-22, certainly not an impressive win but any win on the road is always worth more. They seemed to have a very hard time scoring against the Jets even though quarterback Andy Dalton put up huge numbers, the completed 76.7 percent of his passes for a total of 366 yards, these numbers are not only impressive they surpass almost every other quarterback’s stats for last week, yet they were only able to score 23 points. Why you may ask this was? Well, Dalton was under pressure practically the entire game, he was sacked 7 times, this week he should have an easier time because despite the Steelers marginalizing the Redskins to only 16 points they did not register a single sack during the game. 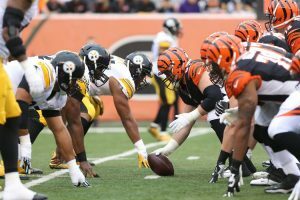 One thing to watch during this game is the battle between the Cincinnati Bengal’s offensive team against the Pittsburg Steelers defensive line, this will be a crucial factor in determining who the stronger team is in the AFC North and it will also decide whether the game surpasses the over/under odds in the game currently at 48.5. The Steelers are a 3-point favorite in the game, and having the home field advantage will certainly serve to justify the football gambling line. This should turn out to be a high powered and high scoring game, that will keep fans on both sides sitting on the edge of their seats. Because of the home field advantage, I will give this to the Steelers but it will be a close game so play them in a teaser with the over. Don’t miss a beat this weekend and place your bets at the best sportsbook in the industry, AceSportsbook.com.